Chicago’s eight artists most influenced by Butoh discuss how and why it works for them. 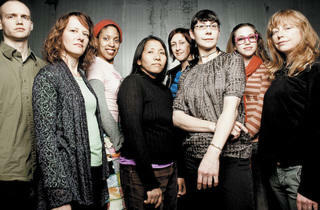 Photograph: Drew Reynolds From left: Adam Rose, Carole McCurdy, Cristal Sabbagh, Wannapa P-Eubanks, Ginger Krebs, Nicole LeGette, Lily Emerson and Sara Zalek. Butoh’s staunchest advocate in Chicago, Nicole LeGette, seven other artists and I recently gathered around a table at DEFIBRILLATOR. The Wicker Park performance gallery and LeGette’s blushing poppy productions are in the thick of coproducing four months of classes, talks and shows by field-leading figures. The performance form, once pegged to slow-moving Japanese soloists in white body paint, now encompasses Montreal-based Martine Viale, who just left town, and Mexican artist Diego Piñón, who arrives June 7. Open classes with Katsura Kan, a former member of Japan’s seminal Byakko-sha troupe, begin Tuesday 10. “It actually resists definitions, by definition,” said Ginger Krebs, who leads Wednesday night Butoh workshops in June and July, and whose Butoh-inspired Myth and Continent opens July 22. The next thing I knew, the nine of us had been talking for an hour and a half. LE: There’s a common misconception that it’s people in white body paint doing painful things really slowly. NL: …And that it’s traditional, or ancient, from the time of Noh [theater] or Kabuki, when in fact it’s a contemporary form. GK: This notion that Butoh is not up-to-date or somehow inconsistent with postmodernism is a real misconception, particularly [Nakajima’s teacher, Butoh cofounder Tatsumi] Hijikata’s stuff, which was so layered and fractured. It’s not a way to return to some idea of the pre-socialized self. What Butoh proposes is way more complex than that. …When it actually forces you to filter out your clichés about what an ‘essence’ might be, or what ‘nature’ means…to hold multiple truths at the same time, and let go of narrative.